Professional Edition: Support for the Nikon NRW raw format (P6000) through the Nikon NRW codec (which exists only in 32-bit flavor). Professional Edition: Partial support for Photoshop PSD files through the Microsoft PSD codec that ships with the Microsoft Expression Blend 3.0 product. When Blend 3 is installed FastPictureViewer Professional is able to open PSD files which were saved with the "Maximum Compatibility" option in Photoshop. The Microsoft PSD codec does not ship separately at the moment and seems to be available only in 32-bit flavor. Stay tuned: PSD support in FastPictureViewer will be broadeded in the near future. 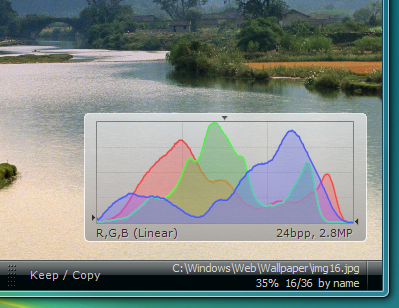 Following a user suggestion, a tiny luminance indicator has been added to the histogram in the form of a small arrow running across the top of the histogram graph. The arrow shows a value between 0 (far left) and 255 (far right) which gives an indication of the image's average luminance - essentially how bright it is. This is merely an indication, calculated as a weighted sum of linear RGB components: Y = R * 0.2126 + G * 0.7152 + B * 0.0722, following ITU-R BT.709, and where the R, G and B components are the corresponding averages computed across the entire image, so it's actually the luminance of the average. There is no rule, but most "normally exposed" images should have the tiny arrow more or less in the central tier of the range and this indicator can be used to compare the relative luminance of a set of pictures (images with nearby average luminances will "look good" next to each other).